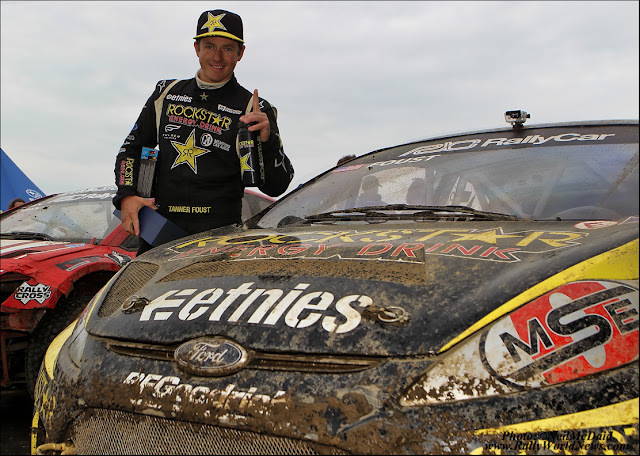 X Games Rally gold medalist Tanner Foust will take on the best racers in the world this weekend when he returns to the annual Race of Champions for a third time. "It's a honor to be back at the Race of Champions in 2010," said Foust. "The opportunity to line up against the best drivers in the world like Sebastian Loeb and Michael Schumacher is incredible." The Rockstar Energy Drink driver, who represented Team USA at the contest in 2008 and 2009, will compete this year alongside Australian motorcycle racing legend Mick Doohan on the All Star Team at Düsseldorf's Esprit Arena on Saturday and Sunday. Foust is a two-time Formula Drift champion, X Games rally star, rallycross competitor, TV host and stunt driver. His All Star teammate Doohan was a dominant force in motorcycle racing in the 1990s, winning over 50 races and securing five 500cc world championships in a row for Honda. The Race of Champions is an annual event that pits champions from Formula One, World Rally Championship, NASCAR, Le Mans, Touring Car Racing and other motorsports from around the world against each other in a series of head-to-head races in an assortment of race cars. The drivers compete both individually in the Race of Champions and as teams representing their countries for the Race of Nations Cup. For the 2010 running of Race of Champions, his All Star Team will line up against fellow Americans on Team USA: Travis Pastrana, X Games motocross legend, and top NASCAR driver Carl Edwards. "For the past two years at Race of Champions, I've represented Team USA alongside Carl and Travis," said Foust. "It's going to be fun to battle it out with them in 2010 but I'm still flying the American flag!" At his 2008 appearance, Foust beat Formula One Champion Jensen Button in front of a home crowd of 80,000 in his first round. In 2009, he took down Michael Schumacher in the Nations’ Cup contest. The ROC is a gathering of the world’s motorsport elite. The event drew eighty thousand plus live spectators and millions of live TV viewers worldwide last year.